Today for the heck of it I whipped up a little web service called FeedCloud that takes any feed and emphasizes interesting words in it (by making them larger). It adds a bit of flair to any feed; plus it works great for skimming long posts. I call it a feedcloud because the result looks kinda like a tag cloud. posted by Jonathan at 5/22/2006 01:07:00 a.m. 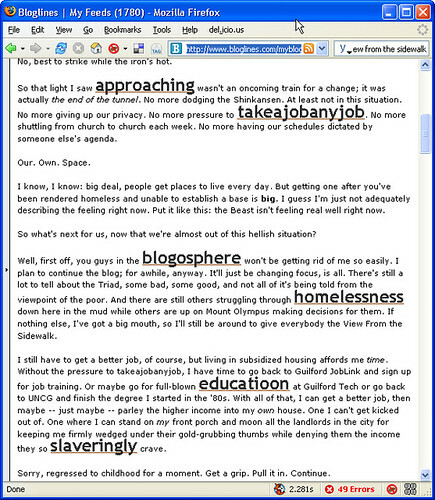 I am a blogger too based in Victoria, BC but don't know about the blog scene here. I would love to join some kinda group you have about here though. It was nice going through your posts. By Ricky, at 6/10/2006 10:47 p.m.
Hi Ricky - Good to hear from you. I'll follow up with you directly. By Jonathan, at 6/10/2006 11:02 p.m.